Cowshed Moody Cow Balancing Body Lotion - a light, non-greasy body lotion that smells gorgeous, has essential oils of rose geranium, linden blossom and frankincense. I think this was a magazine freebie. Repurchase? 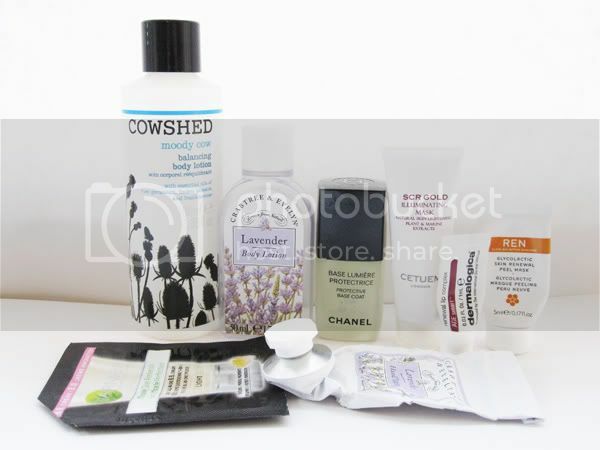 Yes, though I'll probably try some of the other scents by Cowshed first. Crabtree and Evelyn Lavender Body Lotion & Hand Cream - these were OK, but smelt a bit too artificial for my liking. Repurchase? No. Chanel Protective Base Coat - this was an impulse buy, it's a very sub standard base coat and no better than something from Barry M. Repurchase? No. Cetuem SCR Gold Illuminating Mask - a fab exfoliating mask that I got from Boudoir Prive, featured in last month's favourites. Repurchase? Maybe, if I'm treating myself as it's pretty expensive. Dermalogica Renewal Lip Complex - this was lovely to use but the full size is just way too expensive for me to justify buying! Repurchase? No. REN Glycolactic Skin Renewal Peel Mask - I was expecting this to be like a peel-off mask but instead it was like applying fruity marmalade to your face, strange but made my skin feel clean and soft afterwards. Repurchase? Maybe. Garnier Miracle Skin Perfector BB Cream in Light - I seem to be in the minority of people who don't love this. It just didn't suit my oily/combination skin and felt more like an average tinted moisturiser than a proper BB. Repurchase: No. I got the Cetuem SCR Gold Illuminating Mask too but put it on my blog sale because it wasnt really my kinda thing, starting to think maybe i should just use it!